The purpose of this project is to discover ways to produce Biogas with alternate sources by using our local resources. It can help students to basics of Anaerobic digestion and production of gas by different organic kitchen wastage. 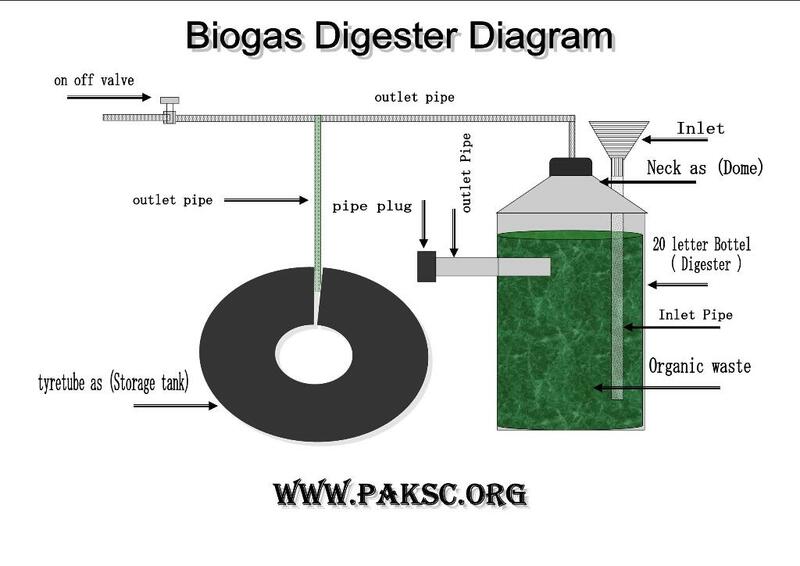 The basic task is to design, make, test a simple waste digester and gas collection system. One can check various facets of the anaerobic digestion process. It is known as a source of renewable energy and it's made mostly of methane (60-70%) and a mixture of CO2 (carbon dioxide), H2S (hydrogen sulfide), NH3 (ammonia), and SO2( sulfur dioxide). This gas is formed when biological matter (usually cow manure), is decomposed in an environment with no oxygen present by bacteria. It has been popular as a source of energy for over 200 years, In order to produce biogas, the individual has to first build an anaerobic (no oxygen present) digester, or an enclosed tank (usually made of steel), where specific types of organic wastes are placed in order for bacteria to decompose them. In the environment, it is produced naturally in deep soils, lake bottoms, and wetlands. Biogas is mostly consist of methane, it is highly explosive and dangerous. There should be no flames or electrical items around the digester. Some elements and molecules present in biogas can cause suffocation. The digester should be placed in a well-ventilated area. After handling the digester or any organic matter, that person should ALWAYS wash his/her hand thoroughly with plenty of soap and water. Carbon dioxide will asphyxiate a person if he/she breathes it. Severe H2S can harm the lungs and other tissues involve in breathing. We will need biomass to make an anaerobic digester. For example, cow manure, grass clipping with soil or any other waste, cow manure serves a starter to produce biogas. A digester needs certain conditions to work properly. For example, there should be a water-biomass ratio of 1 to 5. The pH of this mixture should always stay around 7, acidic or basic pH level will kill the gas producing bacteria. A temperature of 0°C to 69°C, higher production is between 29°C and 60°C. There will be high production at temperature equals to 35°C. The small amount of fresh biomass should be added on daily basis to have enough fresh bacteria to produce large quantities of biogas. After this step, agitates the digester (shake well if it is a small bottle) to mix the biomass with the water. The recommended time for a home-made project is a minimum of 2 weeks. Note: When using manure from any animal remember: ANTIBIOTICS MUST NOT BE GIVEN TO THE ANIMAL!! The container must be airtight, as we know that it’s a digester, that digests the biological waste anaerobically (strictly in the absence of air). Do not use transparent or translucent containers. If it is transparent, paint it black because it keeps the temperature steady, sunlight encourages the growth of algae which retards biogas production. For the first time. use animal dung after any other biological waste that may include plants waste; dried dung, dried leaves, paper etc. But keeping in view that must be mixed in a ratio of 50% with water and shaken well. Leave the outlet open while feeding in the digester so that slurry (the digested mixture of dung and water) comes out of the outlet. The first production of biogas bring up slowly, so be patient, it may take as long as one complete week to produce gas. Add one litre of fresh feed consisting of biological waste and water in 50% ratio to the digester to keep it in good working condition. Avoid the biogas digester from getting in direct contact with sunlight. It must not go out of 30C – 40C temperature variations. Use all safety precautions when testing the biogas, must keep the valve face away while testing the biogas. If you do not find any results after one week of feeding in a biogas digester. Check the pipes for dung or water blockage. Dung from the animals who are being or were injected antibiotics recently for any reasons is highly harmful. The biogas plant is a digester and it involves the production of highly combustible methane gas while constructing a prototype, following prescriptions must be followed. The container that we are using must be airtight, as we know that it’s a digester, that digests the biological waste anaerobically (strictly in the absence of air). Transparent or translucent containers are not to be used for this purpose; it must be painted black because it keeps the temperature steady if sunlight passes through the container it shall encourage the growth of algae. That is quite lethal for the production of biogas. For the first time. Animal dung must be used later on any biological waste that may include plants waste; dried dung, dried leaves or even paper can be used. But keeping in view that must be mixed in a ratio of 50% with water and shaken well. While feeding in the digester, the outlet must stay open so that slurry (the digested mixture of dung and water) comes out of the outlet. Daily one litre of fresh properly mixed biological waste and water in 50% ratio shall be fed in the digester to keep the digester in good working condition.